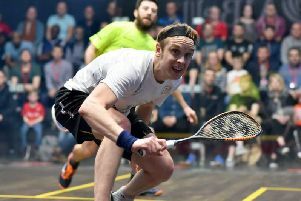 Harrogate-based Willstrop, 33, was appearing in the final of the prestigious season-ending tournament for the first time after beating World Champion Karim Abdel Gawad in the previous round . Mohamed ElShorbagy and James Willstrop collide during their World Series Finals showdown. Picture courtesy of PSA. He was out for revenge after losing 2-0 to ElShorbagy in their Group B clash, which used a best-of-three games format. But he was unable to match the ferocity of ElShorbagy’s hitting as the Egyptian fought through to a 12-10, 11-9, 11-8 victory in 57 minutes. “I thought I could win and went in giving it all I can,” said Willstrop. “It’s an incredible group here this week, so to make the final was a great pleasure. I was loving every minute, apart from losing. He responded today and unified everything I tried to do. Full credit to him, he stopped me playing so there are no complaints. After winning his 254th tour title, ElShorbagy added; “To win this tournament has been a dream for so long.